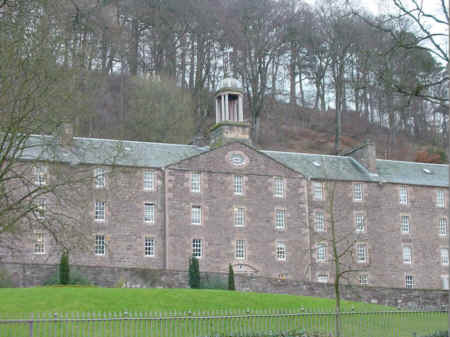 This is a photograph of one of the main buildings at New Lanark. You will see at the top of the picture the bell which would have called the workers to their posts. Although a "model village" there were still rules and regulations. New Lanark is a visitor attraction at the eastern end of the Garden Valley (as the Clyde Valley is increasingly becoming known as) and is just outside the market town of Lanark itself. New Lanark is a world heritage village, which was built over 200 years ago when David Dale (a well-known industrialist) decided to site a series of mills close to the fast flowing River Clyde.